I've been a bit MIA around here lately, but I have a good excuse! We are in the process of buying our first house (closing in 3 weeks) so that has been eating up what spare time I had. We are very excited! I actually have still been squeezing in some time for crafts, I just haven't been good about taking photos and writing blog posts. So this is a knitting update of things that I made several weeks ago since the more recent projects still need to have ends woven in, photos taken, etc. 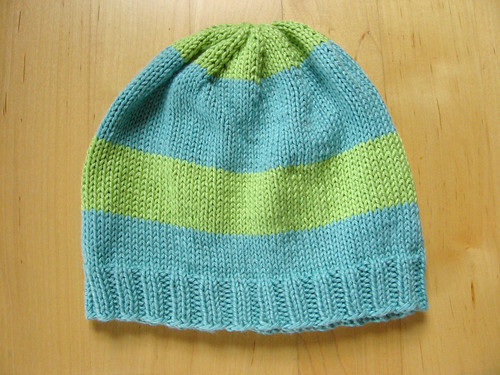 This hat was a quick one that I made for the recent craft hope project to make hats and bags for kids with cancer. 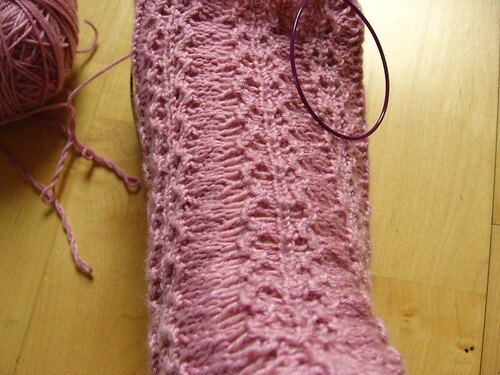 I also was knitting the rose ribs sock pattern from the book Sock Knitting Master Class, which I really should write more about at some point - it's a great book - but I didn't take the time to knit a gauge swatch or even to try on the socks until I was 2/3 through with the first one, and they are way. too. small. Bummer. The lace pattern was so pretty and not that hard to keep track of while knitting, so I may try to knit these again on larger needles or in the larger size at another time. 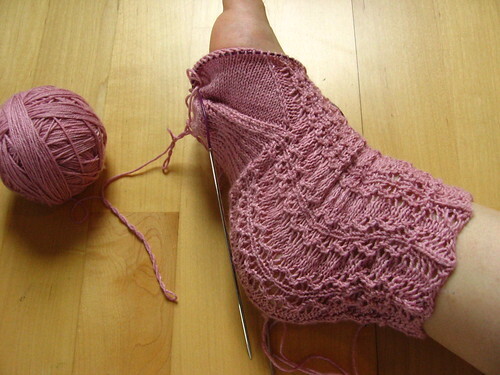 But for now I decided I that my life was complicated enough right now and my knitting should be easy. So I treated myself to some yummy soft malabrigo chunky yarn in this fun yellow/ochre/almost chartreuse color and knitted myself up a quick cowl (the luxe cowl pattern) which I found via angry chicken. I normally don't wear a lot of bright colors so I kind of surprised myself when I bought this yarn, and have surprised myself even more to find that I love wearing it! 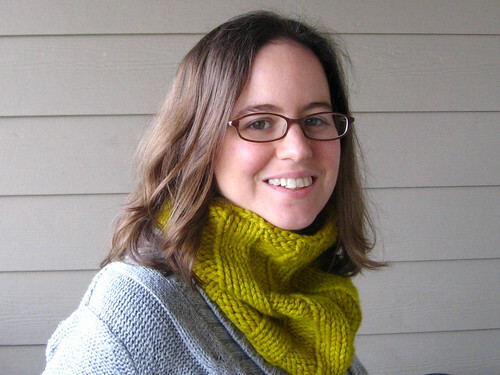 So I am kind of on a run of making cowls... it is starting to feel like spring here but I am tempted to make another before it warms up for real... maybe this one that a friend and I saw a sample for at a yarn shop here in Portland? I have wanted a flannel bathrobe for a really long time, but have always been put off by the fact that they cost what seems like a lot of money, and couldn't I make myself one anyways? Now that I actually have made one, $60 bucks or more doesn't seem that expensive, I have to say. I couldn't stomach buying 6 yards of flannel fabric, so I bought this funny leafy patterned king size sheet at goodwill and then combined it with another flannel sheet that I had in my stash for the contrasting collar/cuffs. 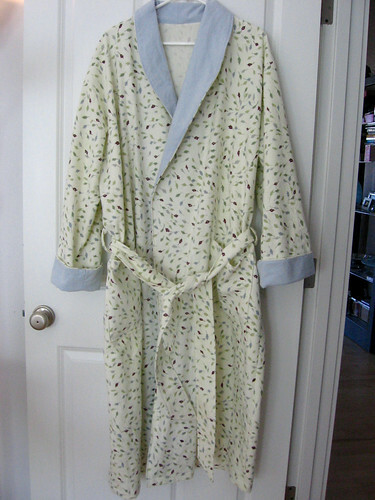 The pattern that I used was Butterick 6837... the robes on the cover looked cute and "very loose fitting" sounded comfy. Unfortunately, I got so caught up in making the robe that I forgot that I am a short person and that I should pay attention to things like sleeve length and making the adjustments that make it worthwhile to have made yourself a custom garment. So, long story short, it's huge on me. The sleeves are way to long, the belt falls way below my waist, and "very loose fitting" is an understatement. I am trying to think of it as a wearable muslin, and conveniently it fits Lawson perfectly so I gave it to him. Lawson pointed out that this robe is not exactly manly and then had the great idea that I could dye it green or blue - so I may do that at some point in the future. Although really, now that I have "given" it to him, it doesn't annoy me that it's oversized if it's because I am borrowing my husband's robe... so I have basically claimed it back. I bought another sheet to make another one if I have the time and energy, and honestly I am not sure if I do make another one if I will use this pattern and try to adjust it, or if I will just find a new pattern that is a bit more fitted. 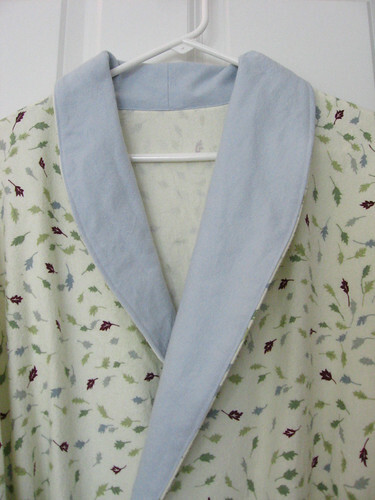 Luckily I am not in a rush, since I now do have a nice snuggly (if extremely baggy) robe to wear!